Crystal clear, fast and reliable prints are what the HP 4315 is renowned for. Ultimately your HP 4315 will consume all of your printer ink, and when that happens you'll discover that replacement HP 4315 ink tends to be really pricey. Thank goodness you have no reason to panic about coughing up the high asking prices you'll get on the main street because now at Cartridge Save you can get all the HP 4315 cartridges you'll need at ultra low prices. Save a lot of cash on your ink by purchasing online with Cartridge Save! Don't pay high prices on a 4315 original cartridge or 4315 compatible ink on the high street when it is much more straight forward to save a bunch of cash buying online with Cartridge Save. Have total confidence when you buy your OfficeJet 4315 ink cartridges from us because every single one is protected by a no quibble money back guarantee. Bear in mind the fact that each order has free delivery, usually delivered the next working day! This sheet-fed all-in-one printer is integrated with a scanner, fax machine, and copier, and is aimed at individuals seeking a compact but affordable and reliable multifunction device for basic office use. Unfortunately, the HP Officejet 4315 is quite outdated by today's standards with its bulky appearance, sub-par text output quality, and inferior speed. Using colour inkjet printing technology, the HP Officejet 4315 is a midrange all-in-one printer with useful additional features like a 48-bit 1200x1200 dpi scanner, a 33.6 Kbps fax machine, and a colour copier. It is sheet-fed, runs on 16MB of RAM, and weighs 12.1 lbs. he HP Officejet 4315 is 7 inches tall and 16.8 inches wide – a little bulkier than comparable devices. Boasting a maximum of 20 ppm in monochrome and 14 ppm in colour, the HP Officejet 4315 is great for printing documents and copies. Users have the option to use 4 or 6-ink cartridges, with the latter significantly enhancing the quality of colour prints. The HP Officejet 4315 helps increase productivity with its fax forwarding and auto redial features. The printer is also capable of borderless printing on 4x6-inch photo paper. 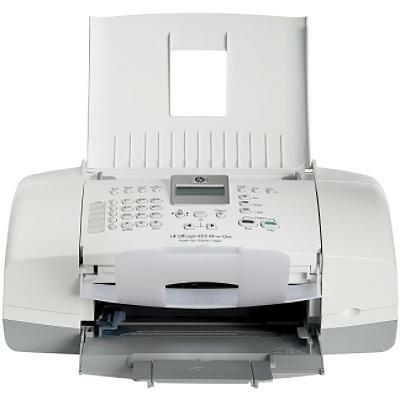 Users can use it as a standalone fax machine and copier, too. This outdated printer lacks essential features such as junk fax blockers and a more efficient scanner that can handle thicker sheets. The standard capacity of the paper tray is 100 sheets, but the output tray can only accommodate 20, which is absurd, considering that the HP Officejet 4315 is marketed for office users. Compatibility is another issue, especially with newer operating systems.